The ever popular jungle boot has been around for almost 70 years. This timeless design goes back to World War II when U.S. troops operating in Panama needed a combat boot that would perform in damp climates and quick drying after crossing streams or rivers. 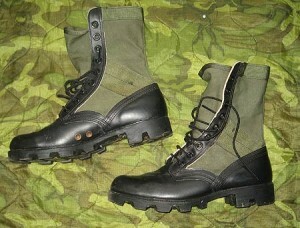 Prior to the introduction of this boot, “Jungle foot” was the biggest danger to soldiers operating in wet, tropical settings. This condition occurred when moisture and water in the boot caused feet to be infected with bacteria or fungus. When left untreated, ” Jungle foot” could easily disable a soldier in the field because he would not be able to walk or wear his boots. This condition became one of the most common hazards for troops because of the importance of foot care. The jungle boot allowed for quick drying and was ideal for tropical environments. It also added a sole pattern with large lugs, named the Panama outsole which improved traction on muddy inclines and declines and would grab on to tree roots, rocks, and other types of uneven terrain. This lightweight design featured canvas webbing for breathability and protection. Over the years, other features were added such as a steel shank to protect against sharp walking hazards such as pungy sticks which were used against American GIs during the Vietnam War. 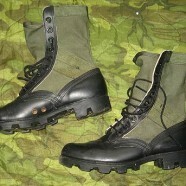 A desert version of the jungle boot was introduced in the early 1990s during Operation Desert Storm for relief from extremely hot temperatures of the Persian Gulf. Today it is sold by 2 primary military boot manufacturers, Altama and Wellco, and it remains one of the top selling models still today.